The themes reminds me a lot of Feed on a very superficial level, but this is very much it's own book and the characters are totally different. It is still a bioengineering near future thriller and I think it really delivers both on the thriller part and on the science part. I really enjoyed Sal and Nathan's relationship and how Sal's family was coping with her not having their daughter's memories. It was also really cool to see her interactions with the company. I am very much looking forward to the next one and I was sad when it finished. 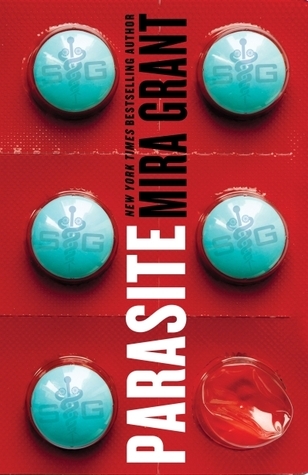 The themes of Parasite reminds me a lot of Feed on a very superficial level, but this is very much it’s own book and the characters are totally different. Both books deals with a bioengineering near future thriller where some sort of medicine has gone horribly wrong and we end up with something like zombies. They are also both thrillers and of course written by the same author, but that is where the similarities stops. Grant is exploring the idea that we as humans are willing to be sold something that is too good to be true if it gives us what we want aka. good health. Who wouldn’t want to get rid of cancer, allergies, autoimmune disorders, get easily regulated medicine etc… If your doctor told you the product was safe, wouldn’t you take it? I think I probably would – especially if he suggested it in the middle of pollen season. I really enjoyed Sal and Nathan’s relationship and how Sal’s family was coping with her not having their daughter’s memories. The family has to deal with the fact that the daughter they knew before the accident is now dead and that they have a different person as a daughter who look just like the girl they knew. It is not a new idea but it is great to see it explored again. Sal’s interactions with SymboGen Corporation (go watch the videos), are so interesting. On the one hand they are her protectors and her health care providers, on the other hand she is their test subject and she always fears that someday they will just keep her there. But at the same time their company is the first home she has any memory off. She feels more at home at hospitals than she does at her own house. I really enjoyed the small bit’s of fictional non-fiction in between the chapters, small interview bits, bits of advertisements and diaries. They worked as great world building and freed us from long exposition pieces within the rest of the text. The challenge that is set in Sal’s part, is does she want to know what is really going on, or does she want to say ignorant, obvious and perhaps even safe? Does she want to open the doors that can not be closed again, because you can not un-know something. I am very much looking forward to the next one and I was sad when it finished. I could easily have read 500 pages more and not tired of it. So I am very happy the next book comes out next year. The themes reminds me a lot of Feed on a very superficial level, but this is very much it's own book and the characters are totally different. It is still a bioengineering near future thriller and I think it really delivers both on the thriller part and on the science part. I really enjoyed Sal and Nathan's relationship and how Sal's family was coping with her not having their daughter's memories. It was also really cool to see her interactions with the company. I am very much looking forward to the next one and I was sad when it finished.